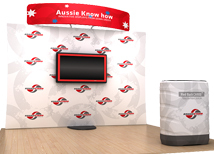 The Standroid is a great new way to incorporate flat screen monitors into any trade show booth. All of the Standroid systems include a build in monitor stand that can be used with the display, or by itself. The Standroid can also be incorporated into the popular Waveline and OneFabric lines to create a very versatile modular display system. With a 5 day turnaround the Standroid can be ready in time for your next show! 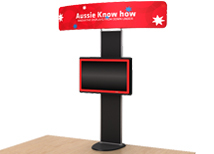 The Standroid is a low cost solution for using flat screen monitors at any trade show or marketing event. There is also a large header that is incorporated to make the Standroid stand out from the crowd. The key benefit to the Standroid system is that it is designed to be used by itself or with the display system. This works great for smaller shows or events where a full size backdrop can not fit.